Explain how an object must be displaced for a force on it to do work. Explain how relative directions of force and displacement determine whether the work done is positive, negative, or zero. The scientific definition of work differs in some ways from its everyday meaning. Certain things we think of as hard work, such as writing an exam or carrying a heavy load on level ground, are not work as defined by a scientist. The scientific definition of work reveals its relationship to energy—whenever work is done, energy is transferred. For work, in the scientific sense, to be done, a force must be exerted and there must be displacement in the direction of the force. To find the work done on a system that undergoes motion that is not one-way or that is in two or three dimensions, we divide the motion into one-way one-dimensional segments and add up the work done over each segment. Figure 1. Examples of work. (a) The work done by the force F on this lawn mower is Fd cosθ. Note that F cosθ is the component of the force in the direction of motion. (b) A person holding a briefcase does no work on it, because there is no displacement. No energy is transferred to or from the briefcase. (c) The person moving the briefcase horizontally at a constant speed does no work on it, and transfers no energy to it. (d) Work is done on the briefcase by carrying it up stairs at constant speed, because there is necessarily a component of force F in the direction of the motion. Energy is transferred to the briefcase and could in turn be used to do work. (e) When the briefcase is lowered, energy is transferred out of the briefcase and into an electric generator. Here the work done on the briefcase by the generator is negative, removing energy from the briefcase, because F and d are in opposite directions. In contrast, when a force exerted on the system has a component in the direction of motion, such as in Figure 1(d), work is done—energy is transferred to the briefcase. Finally, in Figure 1(e), energy is transferred from the briefcase to a generator. There are two good ways to interpret this energy transfer. One interpretation is that the briefcase’s weight does work on the generator, giving it energy. The other interpretation is that the generator does negative work on the briefcase, thus removing energy from it. The drawing shows the latter, with the force from the generator upward on the briefcase, and the displacement downward. This makes and therefore, is negative. Work and energy have the same units. From the definition of work, we see that those units are force times distance. Thus, in SI units, work and energy are measured in newton-meters. A newton-meter is given the special name joule (J), and One joule is not a large amount of energy; it would lift a small 100-gram apple a distance of about 1 meter. We can solve this problem by substituting the given values into the definition of work done on a system, stated in the equation The force, angle, and displacement are given, so that only the work is unknown. This ratio is a tiny fraction of what the person consumes, but it is typical. Very little of the energy released in the consumption of food is used to do work. Even when we “work” all day long, less than 10% of our food energy intake is used to do work and more than 90% is converted to thermal energy or stored as chemical energy in fat. Work is the transfer of energy by a force acting on an object as it is displaced. The work done by a force is zero if the displacement is either zero or perpendicular to the force. The work done is positive if the force and displacement have the same direction, and negative if they have opposite direction. 1: Give an example of something we think of as work in everyday circumstances that is not work in the scientific sense. Is energy transferred or changed in form in your example? If so, explain how this is accomplished without doing work. 2: Give an example of a situation in which there is a force and a displacement, but the force does no work. Explain why it does no work. 3: Describe a situation in which a force is exerted for a long time but does no work. Explain. 1: How much work does a supermarket checkout attendant do on a can of soup he pushes 0.600 m horizontally with a force of 5.00 N? Express your answer in joules and kilocalories. 2: A 75.0-kg person climbs stairs, gaining 2.50 meters in height. Find the work done to accomplish this task. 3: (a) Calculate the work done on a 1500-kg elevator car by its cable to lift it 40.0 m at constant speed, assuming friction averages 100 N. (b) What is the work done on the lift by the gravitational force in this process? (c) What is the total work done on the lift? 4: Suppose a car travels 108 km at a speed of 30.0 m/s, and uses 2.0 gal of gasoline. Only 30% of the gasoline goes into useful work by the force that keeps the car moving at constant speed despite friction. (See Chapter 7.6 Table 1 for the energy content of gasoline.) (a) What is the magnitude of the force exerted to keep the car moving at constant speed? (b) If the required force is directly proportional to speed, how many gallons will be used to drive 108 km at a speed of 28.0 m/s? 5: Calculate the work done by an 85.0-kg man who pushes a crate 4.00 m up along a ramp that makes an angle of with the horizontal. (See Figure 2.) He exerts a force of 500 N on the crate parallel to the ramp and moves at a constant speed. Be certain to include the work he does on the crate and on his body to get up the ramp. Figure 2. A man pushes a crate up a ramp. 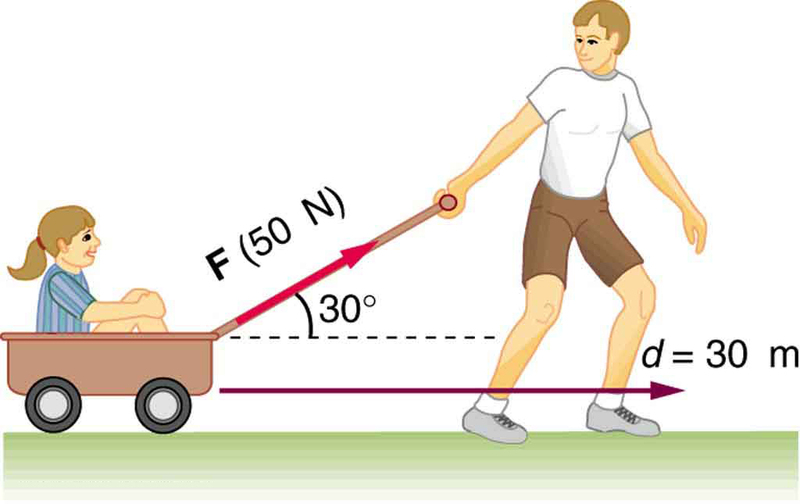 6: How much work is done by the boy pulling his sister 30.0 m in a wagon as shown in Figure 3? Assume no friction acts on the wagon. Figure 3. The boy does work on the system of the wagon and the child when he pulls them as shown. 7: A shopper pushes a grocery cart 20.0 m at constant speed on level ground, against a 35.0 N frictional force. He pushes in a direction below the horizontal. (a) What is the work done on the cart by friction? 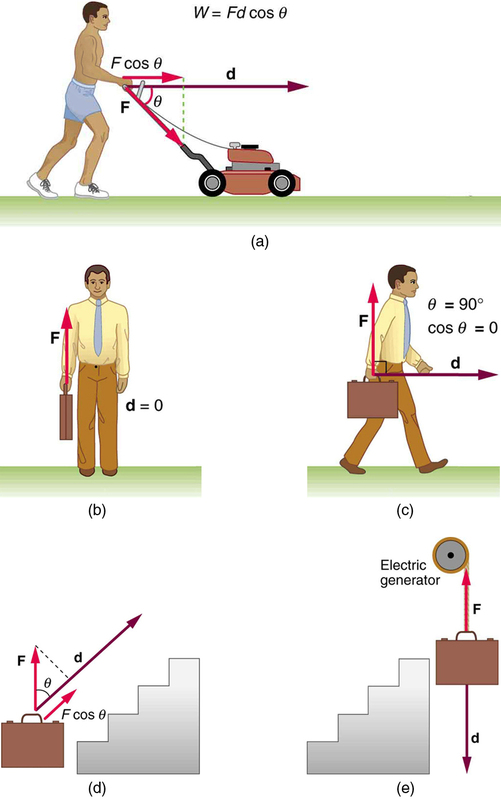 (b) What is the work done on the cart by the gravitational force? (c) What is the work done on the cart by the shopper? (d) Find the force the shopper exerts, using energy considerations. (e) What is the total work done on the cart? 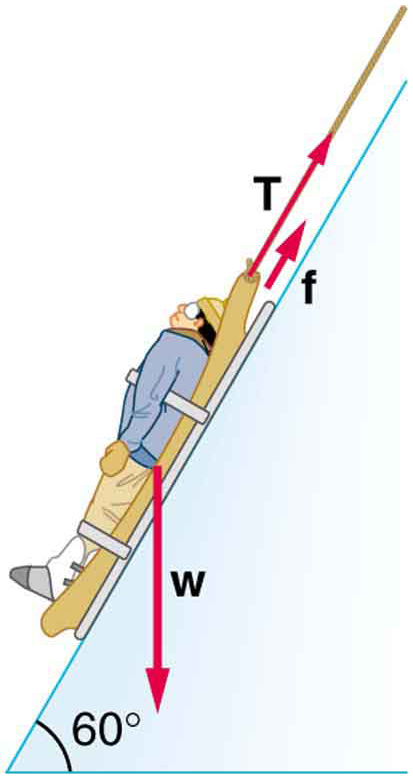 8: Suppose the ski patrol lowers a rescue sled and victim, having a total mass of 90.0 kg, down a slope at constant speed, as shown in Figure 4. The coefficient of friction between the sled and the snow is 0.100. (a) How much work is done by friction as the sled moves 30.0 m along the hill? (b) How much work is done by the rope on the sled in this distance? (c) What is the work done by the gravitational force on the sled? (d) What is the total work done? Figure 4. A rescue sled and victim are lowered down a steep slope. (c) The net force is zero. 7.1 Work: The Scientific Definition by OpenStax is licensed under a Creative Commons Attribution 4.0 International License, except where otherwise noted.